My grandfather, Lou Tolchin, served in the US Army during WWII. 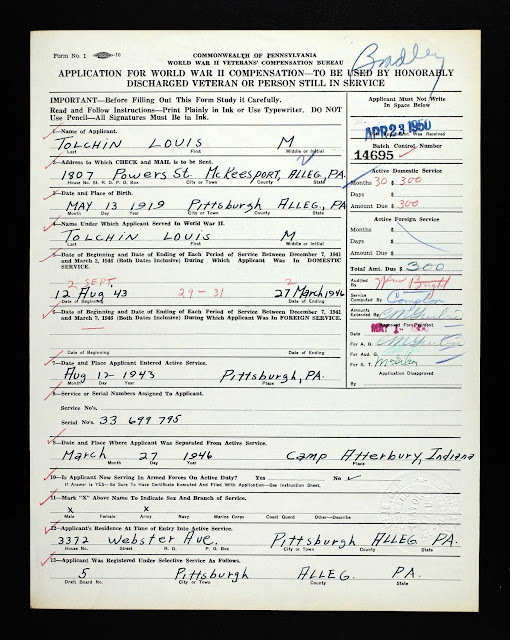 After the war, Pennsylvania gave compensation to veterans--and my grandfather filed for this compensation. All of these applications are up on Ancestry, so if you have Pennsylvania family, check it out! I've had several relatives take mtDNA tests to look at their mitrochondrial DNA, DNA which comes from their direct maternal lines. Some have hundreds of exact matches--which isn't surprising since mtDNA mutates very infrequently--so they haven't been of significant genealogical use (yet). But I looked at my mother's mtDNA results and saw something interesting. Ezra Rutner was a first cousin to my great grandmother, Esther Rutner Joshowitz. He was born to Chaim Mordechai & Pessel Adler on June 15, 1878 in Dulfalva, Austria-Hungary (today Subcarpathian Ukraine. Ezra died in Dulfalva in 1911, aged only 32 of pneumonia--his profession was that as a farmhand/day laborer. I have no mention of Mendel after his birth, and Baruch died as an infant. But what happened to Ezra's other three children? Unfortunately I didn't discover much of a happy ending. Uncle Izzy Joshowitz, my grandmother Minnie's brother, had told me that he'd had an uncle Isaac who had two daughters, Golda and Feige that he remembered from his childhood in Kolodne. And I found records fleshing out a bit more of their lives. My father and his cousin Berly remember a cousin of my grandfather, Jacob "Jack" Landor, who would come to visit the family in Baltimore. Jack was a Merchant Marine who would appear suddenly with presents for the kids. My Aunt Susie says that Jack knew that she and my Uncle Sid collected stamps, so he often sent postcards from exotic places from his travels and made sure to have different stamps on them. I decided to look into him more--and the documents back up Jack's unique nature. According to my cousin Berly, Jack was kidnapped by a woman because he was a beautiful child; he had the bright blue Diamond eyes (which I have as well). She said he was taken to what was then Palestine where he mostly lived in orphanages. Berly recounted by Jack remembered his sister (probably named Basya) as a child and said how Jack always missed her. So what do documents say? The first record I have of Jack is a ship manifest. But this was a unique one--he was the only individual on the page. He had been caught as a stowaway! FamilyTreeDNA has a new tool that attributes genetic matches to your maternal or paternal sides. Roberta Estes has a comprehensive overview here where she also explains how to link your parents' results to yours to generate this sort of breakdown. 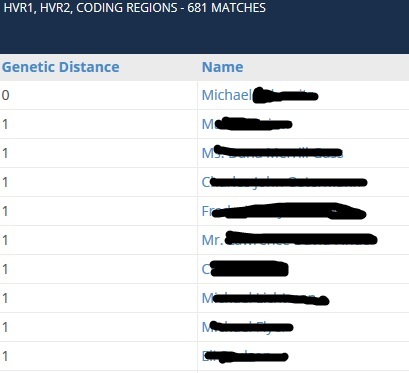 Roberta's example shows her matches nicely broken out between her father's side (700 matches) and her mother's side (487 matches), with only 3 matches inherited from both parents. She also only has a total of 1604 matches--while I have 7053. Because of endogamy, Ashkenazic Jews' DNA isn't as straightforward to deal with as the general population. I put a significant amount of time and effort into this blog. I try to post twice a week, although that doesn't always happen. So why do I have this blog--and why do I continue to post? There are several reasons. This time last year I blogged about Anna Soupcoff who made national headlines when she eloped with a wealthy heir, Carlton O. Lewis. (Details here.) Newspapers talked about the "beautiful Jewess" who won the heir's heart, to the despair of both families. 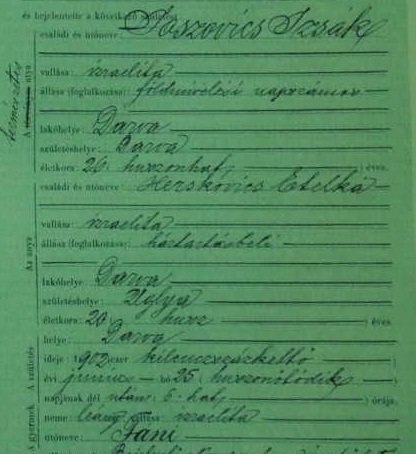 When I originally wrote that post, I mentioned that by the 1910 census, less than two years after her Phoenix marriage, Anna was back living with her family. I assumed that perhaps their different backgrounds clashed or that married life wasn't what they'd expected. I was wrong.